Blog Page | Five Minute Gardening | A Garden that works for me. Have you tasted a tomato and thought it was the best you ever had and wanted to grow your own? You can if you save the seeds. Seed saving is very easy to do for most vegetables. Spring is the time to think about this because you must plan ahead. First, be sure that the vegetable was not a Hybrid (specially bred) because the seeds of these will not likely produce the same results as the Hybrid plant. If you cannot determine the Hybrid status of the vegetable, you can save the seeds to grow next year as an experiment to see what you get. To be sure you get what you are expecting, use seeds from heirloom or non-hybrid vegetables. You might also have to pollinate some plants yourself to prevent crossbreeding and I’ll explain that later. You should save seeds from mature vegetables so that the seeds are fully developed. For example, if you are saving seeds from Squash, allow one or two of the squash to grow to full size until frost, but do not allow it to decay. This will likely become a very large squash. 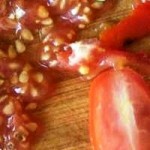 When you cut open a vegetable—a tomato for example—you will see the seeds are surrounded by a liquid gel. 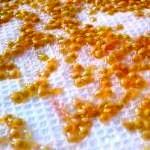 Spread out the gel-seeds on a cutting board and gently drag the seeds out of the gel with a butter knife. You can wash away most of the gel by placing the seeds in a fine strainer, but I don’t bother to do that. Pumpkins and Squash will have a stringy mass surrounding them and you can pull them apart with your fingers. Scrape the seeds off the cutting board onto a paper towel or tissue paper. You want to be sure the paper does not contain any printing, or anti-bacterial, or lotion because this might damage the seeds. Space the seeds out a little so they are not piled on each other, but not far apart. The seeds will stick to the paper, but that’s not a problem as you will see. Large seeds can be placed on a newspaper. Mark on the edge of the paper what the name of the tomato is, or where you got it; for example: “Prayer Plum Tomato/medium sized/from Mike at the office.” I have seeds marked as “Good Flavor” because that’s all I know about them. Set the paper on a plate or wire mesh cooling rack to allow them to dry. DO NOT cover them with plastic or anything that will hold in moisture, or they will rot. Let the seeds dry in a warm (not hot) place for a week or two (maybe as long as a month) depending on the humidity, or the size of the seeds; such as large seeds like Pumpkin or Squash. Corn, Beans and the like should be allowed to start drying on the plant, but harvested before freezing, or wet weather arrives. After these are harvested bring them inside to finish drying. Remove the beans from the dry pods and corn kernels from the dry cob and be sure they dry completely before storing. After the seeds on the paper are completely dry, place them (paper and all) into a container with a tight fitting lid and store them in a cool (not freezing) and dark place. Under my basement stairs works for me. Next Spring, take the paper towel and cut out a section of the seeds leaving the seeds stuck to a patch of paper. You can cut the paper into squares or strips to fit into the pots. 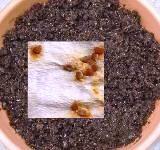 Put some damp soil in a flower pot (almost full) and then place the seed-laced patch of paper on the soil. Cover with about ¼” – ½” of soil and water them in. The paper will disintegrate as the seeds sprout and it will not affect their growth. Don’t forget to label the pots with the name you wrote on the paper. That’s all there is to it… Enjoy! I mentioned that some plants will have to be pollinated by you to be sure you get the best results. This can be tedious for some vegetables. For example, with Squash you need to get to the garden in the morning as the Sun comes up because you need to be there and ready before the flowers open. The reason for this is that you do not want pollen from one variety of Squash to cross-pollinate with another variety. If flowers cross pollinate between a Squash and a Pumpkin the resulting seeds might grow next year to be an odd looking vegetable of Squmpkin or a Pumash. If you grow hot Peppers and green Bell Peppers next to each other and they cross pollinate, you could get hot Bell Peppers next year. To manually pollinate a plant, you need to find a male flower and a female flower, so look for these two the day before you plan to go out the next morning. 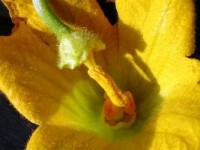 The female Squash flower will have a tiny Squash right behind the flower and the males will just have a stem. Generally speaking, male flowers will grow tall on a long stem and female flowers will be shorter and close to the base of the plant. As soon as the flowers are opening, take a small paintbrush (like an artist brush) and rub it against the pollen covered parts inside the center of the male flower. Then quickly transfer the brush to the female flower and rub it on the inside parts; thereby transferring the pollen. If you do not have a paintbrush, you can cut off the male flower from its stem and peel away the petals exposing the pollen pods; then rub them on the female flower as shown. You have now pollinated the female flower just like a Bee or other insect would have done. Take a rubber band and close up the petals of the female flower so no other pollen can get in by wind or by Bees. Mark this plant, or the Squash that was pollinated, so you will remember to not harvest it until it is mature. This Squash will get very large and will probably be too tough to eat, but this sacrificed vegetable will give you more seeds (hundreds) than you could possibly grow in a home garden. That’s all there is to it; give it a try.